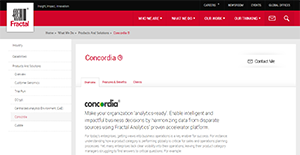 Concordia is a scalable and analytics-ready data harmonization service offered by Fractal Analytics. The platform takes disparate data sets and automatically works on validating, harmonizing, and verifying them. This saves users time and lets them focus more of their attention toward solving more complex analytics-related challenges. With Concordia, organizations can understand how their products and services are performing on a global scale. Insights gleaned from these can prove to be critical for sales and cross-continental operations. That is why the platform assists enterprises in gaining an in-depth understanding of their operational processes by harmonizing disparate data, so they can find the answers they are looking for. Answers to critical business-related questions are usually found in data generated by a company’s operations. However, in most cases, these data are coming from multifarious sources. This is where Concordia comes in. The platform ingests data from various places and takes care of harmonizing them so that users can make sense of them and gain insights that would help their business. Concordia supports the addition of new data sources into the system even after initial set-up. This allows organizations to process data from a broad range of sources with ease. With Concordia, businesses can arrange data the way they want to. The interface supports customization and categorization by country and by product that makes it easy for users to find the information they require. Concordia boasts its analytics-readiness, as this is the feature that enables enterprises in making headway in the industry niches they are in. The platform begins the process by processing data in a central database that can be utilized in gaining a deeper understanding of business operations. With Concordia, users can dedicate more of their time to other manual tasks. That is because the solution automates the data harmonization workflow from data ingestion to the output. This process is facilitated by the built-in library of prepared business rules. This can lead to faster decision-making times and also frees up the bandwidth of analytics teams. If you are considering Concordia it might also be a good idea to examine other subcategories of Best Artificial Intelligence Software gathered in our database of B2B software reviews. There are trendy and widely used applications in each software group. But are they automatically the best fit for your organization’s unique needs? A popular software solution may have thousands of subscribers, but does it provide what you require? For this reason, do not blindly shell out for popular systems. Read at least a few Concordia reviews and mull over the elements that you want in the software such as the price, main functionality, available integrations etc. Then, choose a few apps that fit your wants. Try out the free trials of these platforms, read online opinions, get information from the maker, and do your research systematically. This profound research is certain to aid you find the finest software platform for your organization’s special requirements. How Much Does Concordia Cost? Concordia is for organizations looking to harmonize disparate data sources. Those interested in the solution can ask for a demo and request for their enterprise pricing plans via email, phone, or web form. We realize that when you make a decision to buy Artificial Intelligence Software it’s important not only to see how experts evaluate it in their reviews, but also to find out if the real people and companies that buy it are actually satisfied with the product. That’s why we’ve created our behavior-based Customer Satisfaction Algorithm™ that gathers customer reviews, comments and Concordia reviews across a wide range of social media sites. The data is then presented in an easy to digest form showing how many people had positive and negative experience with Concordia. With that information at hand you should be equipped to make an informed buying decision that you won’t regret. What are Concordia pricing details? What integrations are available for Concordia? If you need more information about Concordia or you simply have a question let us know what you need and we’ll forward your request directly to the vendor.